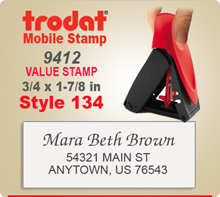 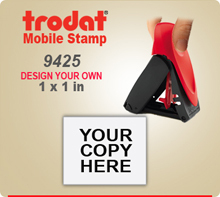 Trodat 9411, 9412, 9413, 9425 and 9430 Mobile Value Stamp is designed for your pocket, your purse or your briefcase. One pinch on the flat little stamper opens it to make a full Rubber Stamp imprint from address stamp size to square inspection size. 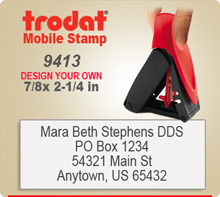 Order your Trodat 9511, 9412, 9413, 9425 or 9430 Mobile Stamp by 4 pm Central and it will ship next morning.